What are the political and economic prospects for the European project? 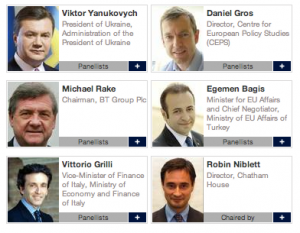 On the panel were Viktor Yanukovych (President of Ukraine), Daniel Gros (Director, Centre for European Policy Studies (CEPS)), Michael Rake (Chairman, BT Group Plc), Egemen Bagis (Minister for EU Affairs and Chief Negotiator of Turkey) and Vittorio Grilli (Vice-Minister of Finance of Italy) with Robin Niblett of Chatham House in the chair. The main problem (aside from the very grey-suited and male nature of the panel) was the lack of attention paid to the questions for the panel, and the outright evasion of some of the questions posed from the floor. From a rhetorical point of view, Egemen Bagis was the star of the show. With a grasp of English better than the others present, and with a glint in his eye and a cheeky smile, he was keen to draw broad brush conclusions about the future of the EU. It’s not so bad, he said, as after all the EU has guaranteed peace in Europe and for that we must be grateful. The problem for Bagis was that his rhetorical skill could not cover the glaring problem with the political content of what he was saying “We could join the EU tomorrow” he asserted confidently, but went on to say that he thought Turkey could join the EU but not the Euro, an assertion that earned him a ticking off in the Q&A from former member of the European Commission Meglena Kuneva. The man with the stern expression was Ukraine President Yanukovich. His opening remark was essentially a long list of the reforms his party has passed in Ukraine, but the interesting point was his non-answer to a question posed to him by Chalres Grant. With Yulia Tymoshenko in prison and this issue blocking EU-Ukraine relations, posited Yanukovich, would it not be better for Ukraine to orient itself further towards Russia than towards the EU? The name of his nemesis did not pass Yanukovich’s lips, and he sat his very large frame on the metaphorical fence, saying that the CiS customs union had only been in place for one year, and underlining that he was elected on a platform that promised ongoing negotiations with the EU. We were left none the wiser. Irony too that at the moment Yanukovich was addressing WEF, Parliament back in Ukraine was passing a controversial language law. Michael Rake, Chair of BT, brought a business perspective, highlighting the ongoing problems of the single market, although his main soundbite was about Turkey – the EU needs Turkey more than Turkey needs the EU. Very true, although populations of many EU Member States may not see it that way! Gros and Grilli gave more EU-institutional points of view, explaining the challenges the EU faces but largely failing to solve them. So did we get to the heart of any issue? Not really. We don’t know any more about the future of the Euro, nor on the political decisions needed to save the single currency. We don’t know the real degree of determination that either Turkey or Ukraine have towards the EU. A game of elite shadow boxing was played out on stage – fun to watch, but there was no knockout.